In recent years, electric devices are increasingly being connected to networks. Reflecting this trend, researchers are actively investigating how to control these devices from a network and which combinations of devices provide a user with optimum services. We call the environment produced by such networking a smart office. Such an environment primarily focuses on service or connection methods. However, security in a smart office is important, yet has not been sufficiently discussed. This issues include relations between devices and users, and changing environments and users. In order to solve these problems, we built a security system using role-based access control (RBAC) as the base. RBAC considers cases in which objects and users have a complex relations. In this paper, we present our system that provides not only access control of devices, but also provides access control of services. 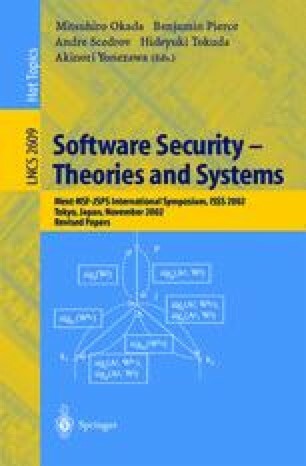 Freier, A., P. Kocher, and P. Kaltorn, SSL v3.0 specification. Technical Report http://home.netscape.com/env/ssl3/s-SPEC.HTM, IETF Task Force.